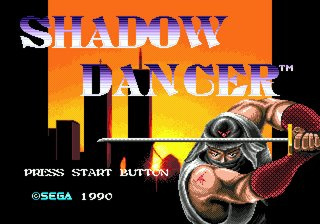 Shadow Dancer started out life in 1989 in the arcades as the sequel to the ever-popular Shinobi, which was a sizable hit for creator Sega. In the same year the company also released the rather excellent Revenge of Shinobi as an early title for the fledgling Mega Drive/Genesis. It strayed from the classic arcade formula by introducing an energy bar to allow the player to take several hits. 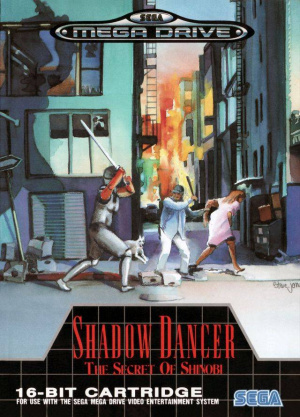 The Mega Drive version of Shadow Dancer released a year later as the follow-up to Revenge of Shinobi sought to take things back to basics with more the challenging one-hit-you're-dead rule. The home console release of Shadow Dancer is a very different game to the arcade version; some might argue it is actually a lot more enjoyable. Some common themes are kept intact, but the levels as well as enemies are completely different. The action takes place in a post-apocalyptic New York City in 1997, where a gang of overgrown reptiles have taken over and it’s down to you to restore law and order with your unrivalled ninja skills. Perhaps the most interesting aspect of this chapter of the Shinobi series is the introduction of Shinobi Joe’s trustworthy pooch Yamato, who is all too happy to help him take out troublesome foes. It’s a simple matter of holding down the attack button for a second to give the order for Yamato to attack. While the enemy is struggling with your canine pal you can get in close like a sneaky ninja for a slash of your sword. Be sure to release Yamato at the right time however, as one hit from a bad guy will shrink him into a harmless puppy for a while! 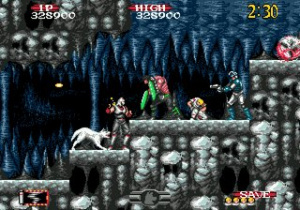 The levels themselves are fairly short like the original arcade Shinobi and allow the player to jump up and down between platforms to perform stealthy attacks, or avoid instant death. Aside from the goal of making it to the end of the each stage unscathed you will also have to rescue the hostages scattered throughout the level too. Joe is armed with an unlimited supply of shurikens to dispatch of all who block his path to victory, but of course true ninja masters will want to get in close for a devastating melee attack. At the end of each set of levels you will encounter a fiendish boss who will prove quite tricky until you learn their attack patterns. 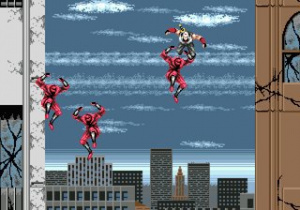 If you are successful in beating them then you enter the bonus round which sees Joe jumping from a skyscraper and taking out as many flying ninjas as possible in his descent. Graphically, Shadow Dancer impresses with large sprites and vibrant colours throughout. Some of the backgrounds are a bit repetitive but there’s plenty of detail and special effects, especially in the opening ‘Burning Downtown’ and later ‘Statue of Liberty’ levels. It all moves effortlessly with no sign of slowdown. The music is decent too, despite the legendary Yuzo Koshiro not being involved and fits the tone of the game perfectly. The sound effects do the job but are a little lacking in places - when you use your ninja magic it sounds like a broken vacuum cleaner! What makes Shadow Dancer so much fun to play is the responsive controls. Collision detection is pixel-perfect so if you die at the hands of the arcade style one-hit mechanics you have no one to blame but yourself. The gameplay is arguably less deep than Revenge of Shinobi, but it works really well with the uncompromisingly tight level designs and on the whole this particular ninja adventure feels a little more boisterous and fun than the dark and brooding prequel. Novices will find the game reasonably challenging on the easiest difficulty setting, but there are on the other two difficulty settings even a gamer with ninja reflexes will be tested. You can even try playing through the game with the option to use shurikens switched off if you think you are tough enough! Challenge is the one area where Shadow Dancer definitely loses out to Revenge of Shinobi; it’s probably a little too easy, although it’s certainly much as much of a walkover as many other Mega Drive releases of the period. If you enjoyed Shinobi III or Revenge of Shinobi – both of which have already released on the Virtual Console - then it’s likely that you will get a kick out of Shadow Dancer too. It’s not quite as difficult and lacks some of the original ideas and glorious set-pieces that made the two aforementioned games so appealing, but the “one-hit” deaths ensure that it’s a slightly tenser and often more exciting experience. Many Shinobi fans have argued that Shadow Dancer does not stand up to the quality of the other two Mega Drive entries, but in many ways it is a lot more fun due to the simpler arcade-like style of play. Regardless of what has been said in the past, you can take it from us that this title comes highly recommended to all ninja fans. Looks fun. Never got into the Shinobi games. Man I had completely forgotten about the New York Apocalypse of Pre-'97...glad this game reminded me. I've never played a Shinobi game and I have seriously got to start sometime. I love Shinobi games. And this one is good as well, just like the other ones. Classics in my book. They are like a nice mixture of the old Castlevania games and Ninja Gaiden games. And this one was of course an instant download for me today. It's just nice with all the Shinobi options on VC. "when you use your ninja magic it sounds like a broken vacuum cleaner!" Fantastic review, Dazza. Shadow Dancer: The Secret of Shinobi for the MegaDrive is a very fun, albeit challenging, game. The soundtrack is awesome, and the graphics are excellent (the wavy flame background comes to mind). EDIT: Oh, and Hooray for the bonus stages!!! I remember old brazilian magazines praising Shadow Dancer at the time. I've only played the Master System port tough. Wow, does the Japanese MegaDrive boxart of this game look impressive. Well done Darren - can't argue with that at all. It's an 8 well deserved. I find this game underrated sometimes. Again, 8 well deserved. Cool, I'll have to pick up the Japanese version. I didn't care for Revenge of Shinobi and when Sega puts out the VCA version (which I'm sure they will) it won't be redundant. Is the arcade game as good as the MegaDrive version, or not as good? Fantastic game! second favorite in the series, after Shinobi III. Bloody hard, though. If I recall correctly, the arcade version is pretty different. Sounds like a fun game...dang I just bought Final Fight 3, looks like this one will have to wait! It's pretty good, but it's not as polished as Shinobi III, methinks. My second favorite Shinobi game after Shinobi III: Return of the Ninja Master, probably one of the greatest, if not the greatest, ninja game ever!! This is excellent. Strange thing is although its very different to its arcade brother it feels more like an arcade game then nearly everything else on megadrive. I think its (arguably) better than the arcade and one of the best megadrive games, Amazing considering it came out in 1990. I wish that games like this where still being made. Not a beater of shinobi 3 (which i cant believe some people give a bad rap). I think it was just not as fondly remembered. @outrun2sp - I think I would agree with your ordering there. Shinobi 3 is my favourite because it's so fast paced, but Shadow Dancer is a lot better for quick pick up and play. Revenge is probably the most creative, but I don't think the controls to be as fluent. At the end of the day all the games are great and worth a look in my opinion. They don't make em like this anymore! This is also my second favourite of the series. If there's one thing I don't get: is why Shadow Dancer was not available on the European version of Sega Genesis Collection (from what I looked up on Wikipedia)? Maybe it's just me, but I love the introductory lines in these reviews. No question, this is my all time favorite Shinobi game. I didn't even realize there was an arcade Shadow Dancer, though; I hope they release that. @StarBoy91 (comment 22): I heard there were some licensing issues in Germany. @Romulo: Okay, wait just a minute. The game actually had licensing issues? I guess that's why a VC release was hold back from us until now. I want someone to download the game that already has the European version on the Sega Megadrive to see if you notice any differences on the Virtual Console. I did download the VC version, there aren't any differences from the original. It never had licensed characters like Revenge of Shinobi so that's not the issue. The German rating boards may have had issues with the perceived violence in a ninja game. That's all I can think of really. @Dazza: Well that's good to hear. But considering that the USK didn't rate this game, should someone in Germany check for it's availability in the Virtual Console? And why would violence be considered an licensing issues? BTW, with the removal of licensed characters, I think Revenge of the Shinobi should have cost 700 Wii Points. That's right. I forgot: the usage of the word ninja was censored back then in Europe. Like, how they changed from Teenage Mutant Ninja Turtles to Teenage Mutant Hero Turtles. @StarBoy: Actually, I find turning off the shuriken makes it easier. Most of the tougher enemies block your shuriken unless you hit them just right; I find it's more reliable to just go with the sword. Really? Guess I might try that someday (even if it means I have to close in on every enemy). This game's more challenging than Shinobi III, but is it more challenging than Revenge of Shinobi? @Dazza: Like I said, I just heard. Really don't know if this was the reason or not. But I did some google research and found a techno band called "Shadow Dancer". Maybe (just maybe) that was the issue. @ StarBoy 91: I think Revenge of Shinobi is extremely difficult. I´ve beaten the first 4 stages of Shadow Dancer, so the game ranks somewhere between SIII & RoS when it comes to challenge. I love this game by the way, more of a "stupid 80´s arcade" feeling than regular Shinobi´s, but I prefer it over RoS. The dog is cute. @FaxanaduGuy - Yamato, cute? Come to think of it, I suppose he is cute. I like how this game has different Ninjitsu's set up for each different stage and level. I also like how the bosses are hard sometimes. My second favorite Shinobi game. Wow, Bakajin wasn't kidding. Non-Shuriken mode is quite easier than the Normal Shuriken mode. I tried that today, and I got to the fifth stage for the first time (I finally beat the fourth stage). Still challenging, but fun. Its true the levels for arcade Shadow Dancer are completely different. So it would be welcome if Sega decided to release it on the VCA. 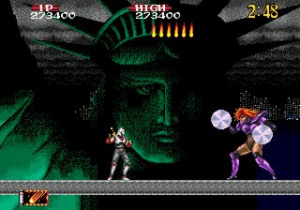 I have lots of time for Mega Drive Shadow Dancer: The Secret of Shinobi, it is action packed, I love the charge & attack Yamato dog gameplay mechanic and the set-pieces like Stage 1-2's environmental changes, plus ascending The Statue of Liberty whilst avoiding the helicopter on Stage 3-2 created memorable 16-bit gaming moments. The base jumping off the side of a skyscraper bonus stages were brilliant, as was the way in which your pooch turned into a cutie li'l puppy after taking a hit. It was under-appreciated by the UK gaming press in 1990, possibly because it removed Revenge of Shinobi's double jump and energy bar and reverted back to the original arcade Shinobi's more unforgiving gameplay style of one hit kills. Robert Swan from classic mag C&VG was particularly tough on it, infamously awarding it a meagre 63%! C&VG were also disappointed that it was not a conversion of arcade Shadow Dancer, but in hindsight releasing a Mega Drive exclusive version was cool. The music is pretty decent too, as Darren noted it is not Yūzō Koshiro, a quick Google search suggests it it may be Yuri Kobayashi (Tsukachan), but don't quote me on that! Shadow Dancer MD has good music, especially during the Statue of Liberty stage.